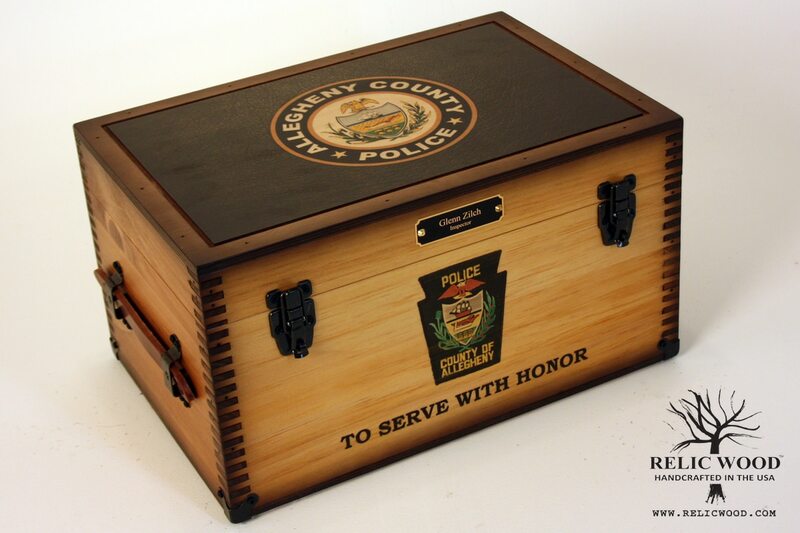 The Custom Police Badge Keepsake box includes YOUR Police Department Badge / Patch artwork on the top. It comes standard with the word POLICE on the front. 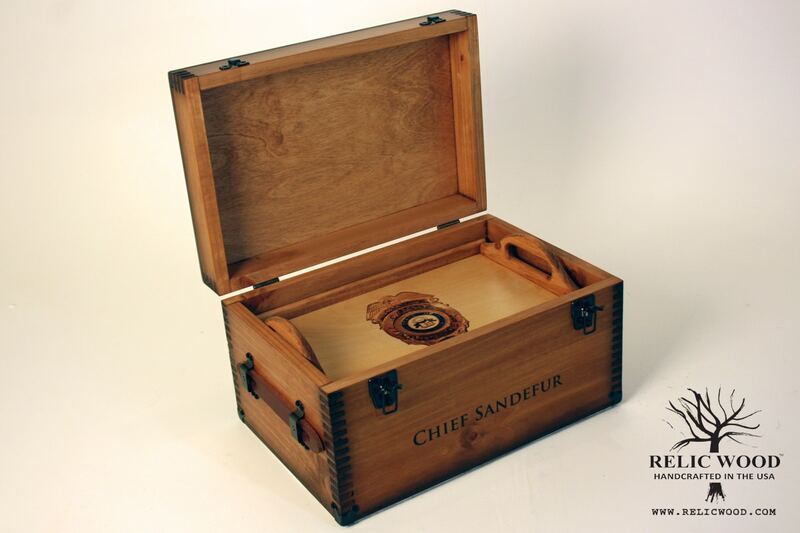 You can also personalize it with a felt shadow box and an engraved brass nameplate up to 75 characters. If you would like to have different artwork on the tray or on the front, you may upload the different art for an additional cost. Included in Price. 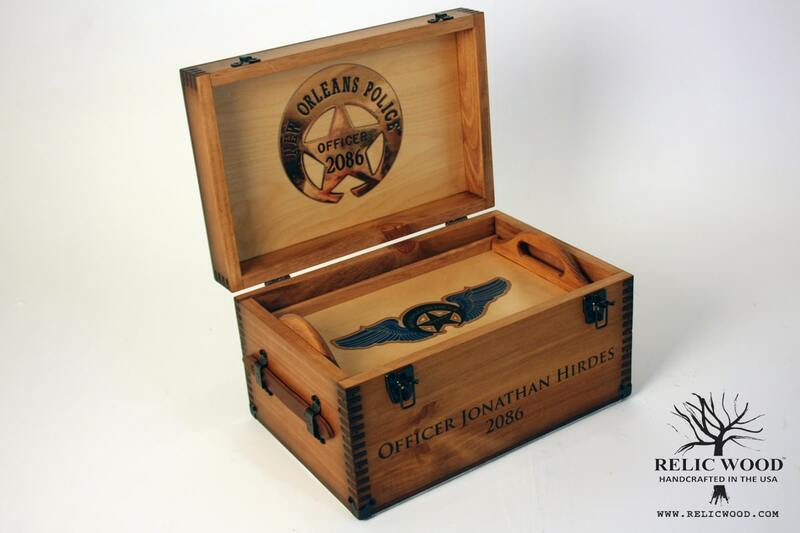 Police Text on Box Front, and your Police Badge or Patch artwork for the box top. High resolution .jpg .pdf .ai. .eps file format. If don’t have the artwork, take a picture straight-on with a smartphone. Customize additional locations. Please select everywhere you want custom artwork. Don’t worry :) We have actual US based HUMAN graphic designers on staff and your final approval is required before we actually put your box into production. Upgrade to black felt shadowbox on the inside lid. Pin awards, patches, badges, pictures, etc. ** Cannot be used if you have selected custom inside lid artwork above. Add US Flag Holder w/ Plexi-glass to inside bottom? One of a kind and handmade in America. 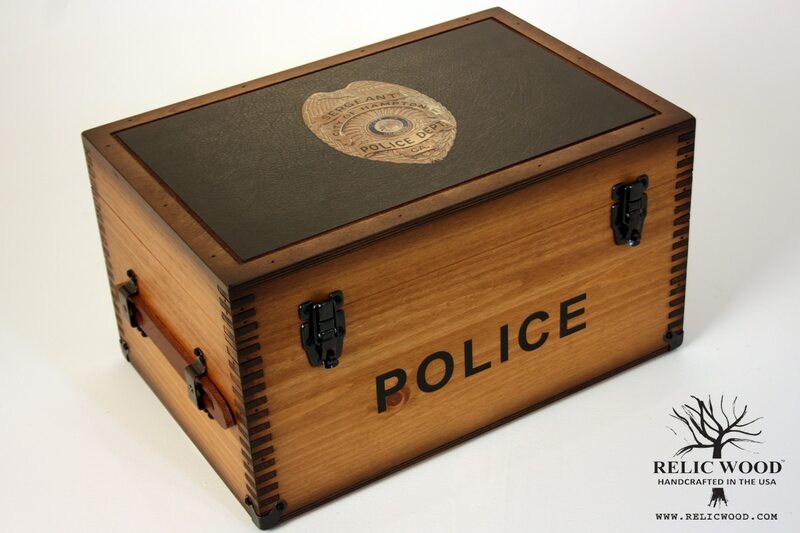 The Custom Police Badge Keepsake box can include YOUR Police Departments Badge or Patch on the top. Personalize it with an engraved brass nameplate up to 75 characters. Features the classic font POLICE text printed on the the box front and a “faux black leather” background image with your Police Dept. badge or patch centered on top. 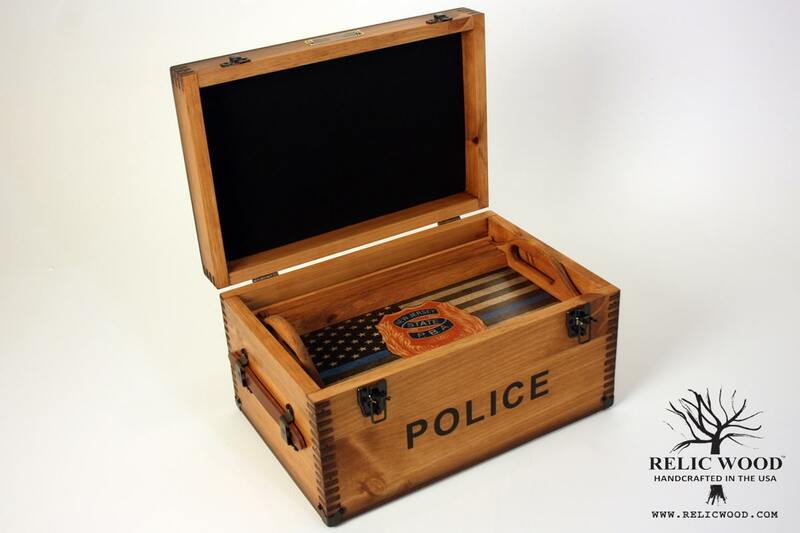 Check out our Custom Police Department Badge Keepsake Box then order yours and make it your own. Once you place your order, one of our graphic designers will setup your project manager page where you will upload your custom artwork within 24 hours. Once you have uploaded your custom artwork, your graphic designer will create artwork proofs for your to review, or they may request more info or additional / better quality artwork. We try to keep all artwork communication via our project manager system to document the creation process. Please be aware that the artwork proofs are only an approximation of what the final product will be and should be used for reference only. 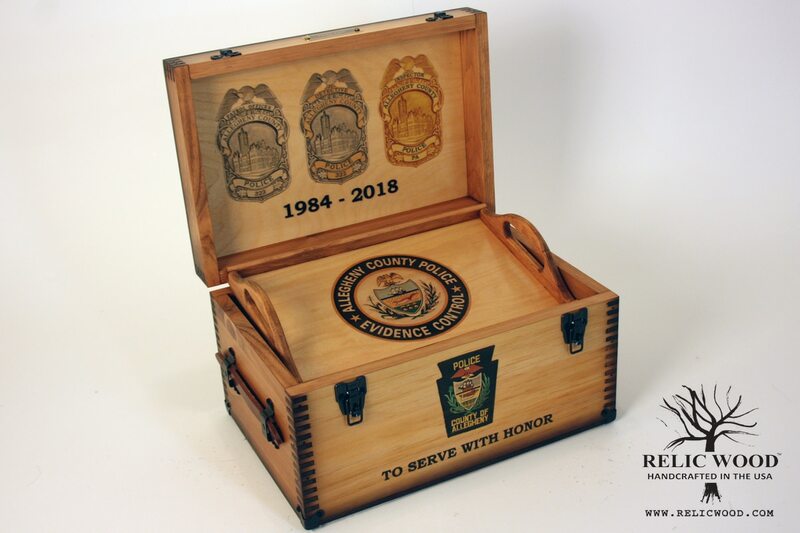 Our custom sublimation process means that your artwork is embedded in the wood and full color artwork will differ somewhat from the renderings. 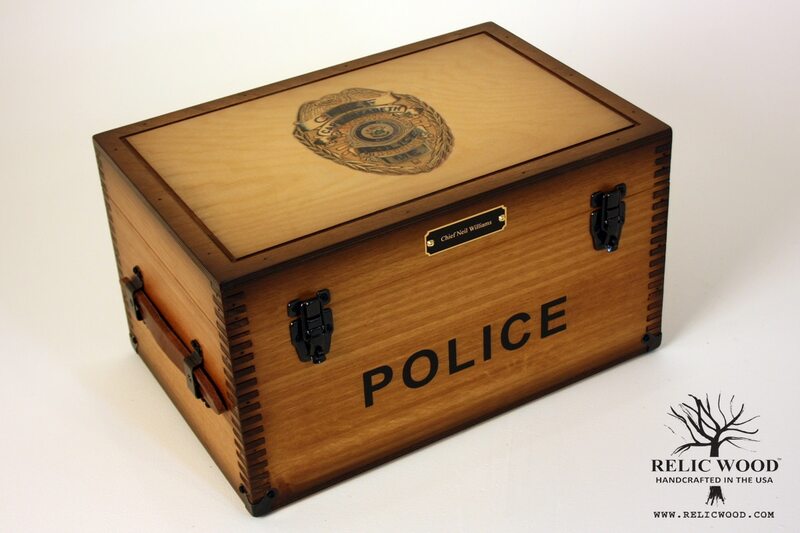 We look forward to making your personalized custom Police Department Badge Keepsake Box soon!